Last year, a teaser surfaced for a horror movie called The Woods, by You’re Next and The Guest director Adam Wingard. This week, Entertainment Weekly revealed that The Woods was actually the working title of Blair Witch, a sequel to influential low-budget 1999 flick The Blair Witch Project. The new film tells a story related to Heather, the protagonist of The Blair Witch Project, whose brother will now return to the woods of Burkittsville, Maryland, to search for his sister. Lionsgate staffer Jason Constantine told EW that “CIA-level security” was utilized to protect this “reboot movie, and keep it in total secrecy.” The marketing stunt seems to have paid off. The original Blair Witch Project kicked off a generation of ‘found-footage’ horror films like Paranormal Activity, Cloverfield, and V/H/S. Blair Witch director Adam Wingard seems an inspired choice for the reboot; You’re Next was a taut piece of horror storytelling, and stylish 2014 action-thriller The Guest was perhaps the most underrated film of 2014. 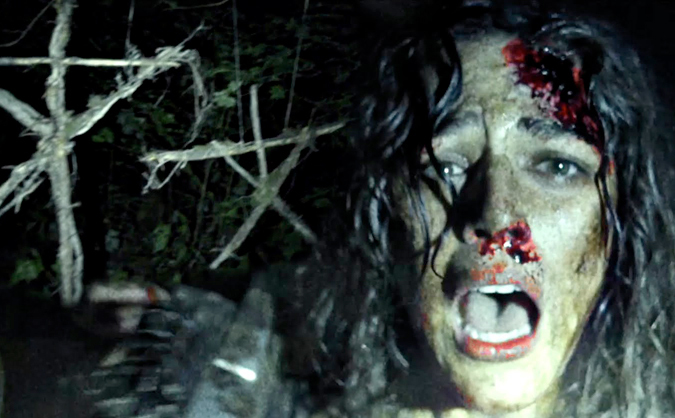 The Blair Witch trailer (watch below) comes packed with familiar sights, including creepy stick figures, people standing motionlessly at the wall, and, of course, lost campers walking in circles. Blair Witch is due September 16.